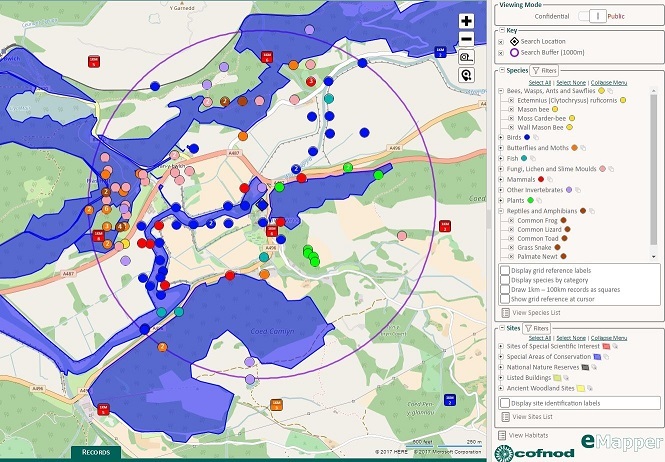 Cofnod holds the most comprehensive species, habitats and sites database in North Wales and offer time saving data services, providing high resolution data for Consultants Ecologists and Wildlife Recorders. Data requests are made through our website and are provided, usually within 2 hours, in our unique eMapper online mapping tool, allowing the data to be manipulated and download in a variety of useful formats. Bat records from North Wales, including monitoring data from known bat roosts and some incidental bat rescue records. Derived from two electronic datasets held originally by CCW (Bat Roosts Database - Caernarvonshire and Anglesey and Bat Roosts Database - North East Wales).